Add the sour cream, mayo and lemon juice to a bowl and use a hand mixer to combine. Then add the parsley and salt, mix with a spoon. 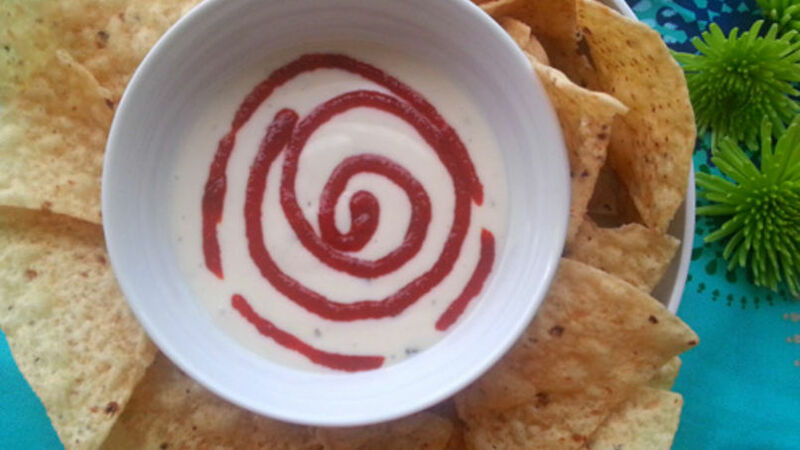 Serve the dip in a large bowl and add the sriracha sauce in a circular motion. If you don't want to do this, just add the sriracha to the preparation and mix. You can decorate with cilantro and serve with tortillas, toasted pita or corn chips. You can also serve with chopped vegetables like celery. carrots, broccoli and cauliflower. You can use another spicy sauce instead of sriracha or serve the sriracha on the side so you guests who don't like spicy food can still enjoy the dip. As you already know, I love putting together parties with friends and it's always good to have a dip recipe ready. The recipe I'm sharing with you today is simple and quick. It can even be prepared a day in advance to save time. I love dip recipes because small snacks can be easily and quickly made at home. I invite you to try this creamy sriracha dip, great for regular and tortilla chips. Enjoy!